← Talk to the hand…and beg it not to kill you! Writer Richard Matheson has managed to have his hand in the horror genre for decades yet somehow stayed under the radar, never reaching the name status of the likes of Stephen King or Clive Barker. Many of his stories can be found in this awesome fiction collection, which I snagged back in the 90s when I was working at Barnes & Noble (it was a store you used to actually go inside to buy books). Aside from writing loads of short stories that have landed on numerous horror anthology shows, and novels that were adapted into movies, like The Incredible Shrinking Man, Stir of Echoes, and I Am Legend (from which the Will Smith film as well as movies like Omega Man, I Am Omega, Last Man On Earth, and Night of the Living Dead are based), he has written loads of horror and sci-fi screenplays, including a bunch of Vincent Price flix in the 1960s, Die! Die! My Darling!, the original Kolchak: The Night Stalker TV pilot movies, and Jaws 3-D.
Director Dan Curtis has proven to have the same effect on the horror genre in the directing realm. 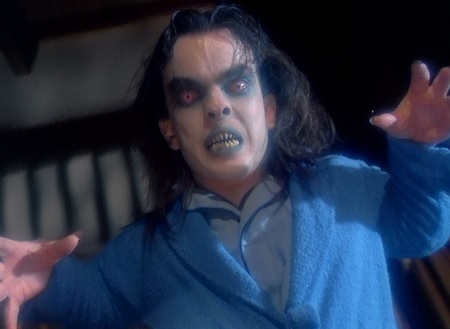 Aside from producing tons of horror faves over the decades, he goes all the way back to directing episodes of the original Dark Shadows, and went on to make many films including Burnt Offerings. 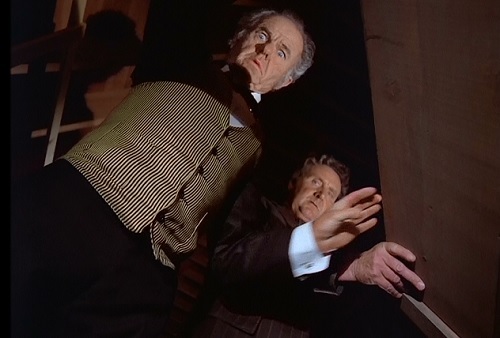 But a good number of his films were made-for-TV collaborations with Matheson, including: Scream of the Wolf, Dracula 1974, Kolchak’s sequel The Night Strangler, and the three anthologies I’m about to cover. 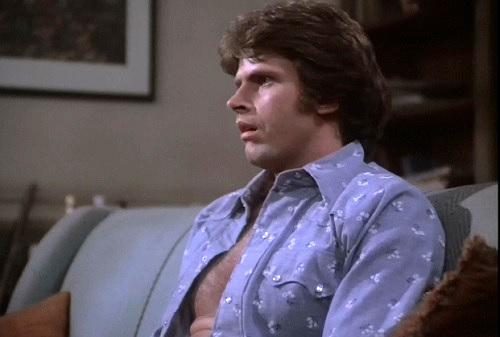 In the 1970s, the first two made-for-TV anthologies by this duo made an impression on the horror genre, each because of one particular standout tale. So, during the 1970s revival in the 1990s, the bigger of the two films got a made-for-TV sequel. 3 movies, 3 trilogies, should be 9 stories in total, but…not exactly…. 1st story – Karen plays an uptight teacher who becomes the lustful object of her male student’s desire. There’s an occult twist, but this isn’t a scary story. 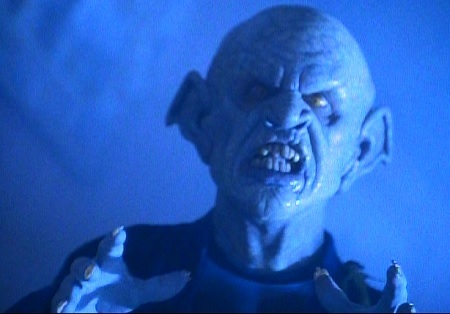 …screams that have echoed through horror time since 1975. 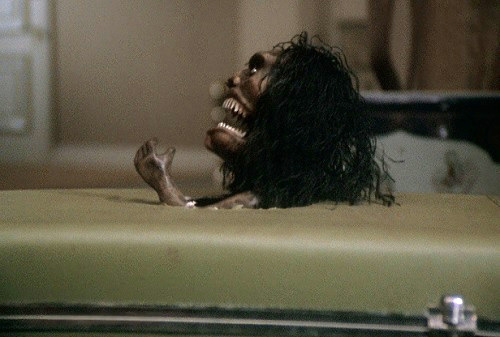 The infamous third story sees Karen battling a freakish voodoo doll in her apartment. The final frame destroyed the souls of many young GenXers back in the day. 1st story – Agonizing. Ed Begley Jr. drives on old car…back to its year of creation, where he has to try to avoid interacting with people from his future for fear of changing the course of history. Oh, look. It’s that blonde chick that was in EVERYTHING in the 1970s. 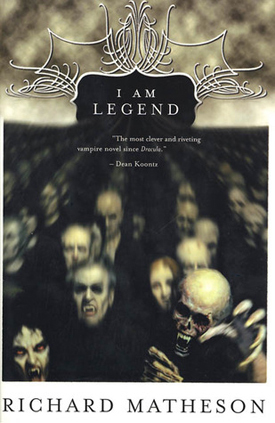 2nd story – I mean, it’s a period piece (blech) vampire story, but it’s told from the perspective of humans…and the POV of the vampire’s coffin? Yawn. 3rd story – This horror zinger is no Zuni fetish doll story, but it’s right up there with the best stories we’d see on episodes of Tales from the Darkside and Tales from the Crypt in the next decade. A woman grieving the loss of her drowned son does a magic ritual to bring him back to life. But he’s not exactly the same, and pretty soon he he’s playing a creepy game of “hide and seek” with her during a thunder and lightning storm. Eek! Actress Lysette Anthony steps into Karen Black’s shoes for this “sequel” (but they totally don’t fit…), which is essentially just a vehicle to introduce the Zuni doll story to a new generation. Two of the three tales here are recycled from the first two movies! Yeah, it’s like a “best of” movie with a bonus tale. 1st story – When a woman and her lover kill her nasty old husband to cash in on his money, they discover his fortune is buried with his body. 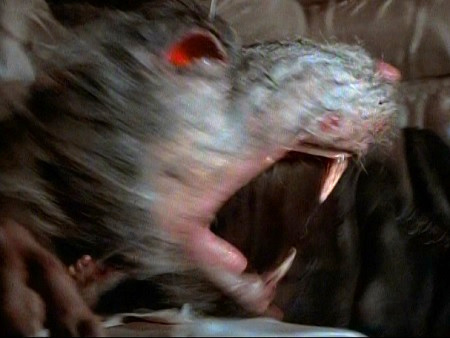 So, they decide to go dig it up…despite warnings about the RATS. Eek! 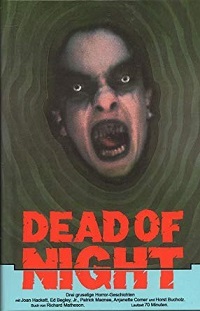 2nd story – This is a duplicate of the good story from Dead of Night, only in this one the monster the mother faces is more like a demon than just the boy in creepy makeup. 3rd story – Picking up right where the original Zuni doll story left off, it’s brought to a museum for a scientist to examine while she’s alone at night. This is simply a carbon copy remake with all the same camera angles, chasing, and leg stabs, the Zuni doll poking its knife under a door, her catching him in a suitcase and trying to grab the knife blade as he saws out of the suitcase (it was stupid enough when Karen tried to do it, even dumber that a scientist would), the doll biting her neck, and her burning him to “death” (in a vat of acid instead of an oven this time). Unfortunately, the attempt to make the final frame slightly different than the original is weak as hell, especially if you’ve seen the original and already know what the general outcome is going to be. 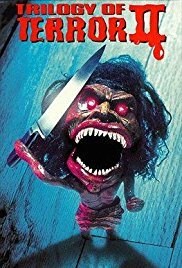 This entry was posted in Everyday I Read the Book: Literary Thoughts, Movie Times & Television Schedules - Staying Entertained, The Evil of the Thriller - Everything Horror and tagged Dead of Night, horror anthology, Trilogy of Terror, Trilogy of Terror II. Bookmark the permalink.